Roger observed that the Professional begins with Step 1, the diagnosis of the problem or identification of the Requirement. Step 2 is a Prescription or recommendation for potential solutions. 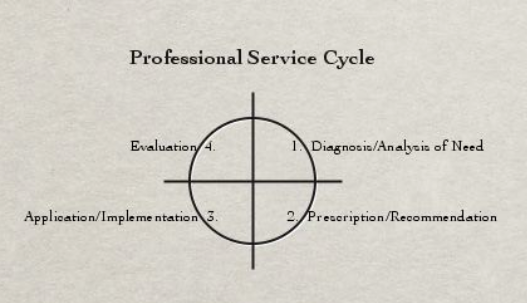 The Labor enters the Cycle at Step 3, applying technology for solving the problem or implementing the Prescription. Step 4 is evaluating the results to determine whether another iteration through the Cycle is necessary. What differentiates the Professional from the Technician is Diagnosis and Prescription. If there is no diagnosis and prescription, there is no Profession. Where there is only Application and Evaluation, it is performed by a Labor, a Trade a Technician. I would submit that with the advent of the information Technologies in the 1940’s and ’50’s, the technologies were sufficiently unfamiliar and complex that it required specialized capabilities to learn to program and run them. Therefore, the Technologists were instrumental in the Application of the technologies, the implementation. To this day, IT people would still say that they are in the business of Building and Running Systems which is Step 3 in the Service Cycle. It is little wonder that “Alignment” repeatedly shows up in the CEO surveys as one of the critical issues needed to be addressed by their Information Technology Community. IT does not do Enterprise problem diagnoses nor prescribe Enterprise problem solutions. IT builds and runs systems. It is little wonder that the technology implementations do not “align” with Management requirements or expectations. This should not be a great shock considering IT starts at Stage 3, the implementation ... not at Stage 1 or 2, the Diagnosis and Prescription. I would observe that Stages 1 and 2 of the Profession Service Cycle are the domain of Engineering and Stages 3 and 4 are the domain of Manufacturing. The practical problem in introducing the concepts of Enterprise Architecture into the existing Enterprise culture is that it flies in the face of 75 years of IT Manufacturing inertia. Here is the cutting edge of the pain of a paradigm shift from Systems Manufacturing to Enterprise Engineering for both IT and the Enterprise!